The impact of the Great Recession and the beginnings of recovery are told in this report about Oregon’s finances. The report covers the period ending June 30, 2014. Oregon was hard hit, forcing difficult budget decisions to bring spending in line with revenues. The state’s biggest challenge was meeting the increased need for state services without enough state revenues, though extra federal funding helped. As the economy recovers, and Oregonians get back to work, it is a good time to examine the state’s financial health for areas that need attention. The state borrowed to build infrastructure and create jobs but the debt payments continue after the money is spent, leaving less money for future maintenance. Health and human services spending grows year after year, reflecting the continued needs of the Oregonians whose income hasn’t rebounded enough from the recovery. 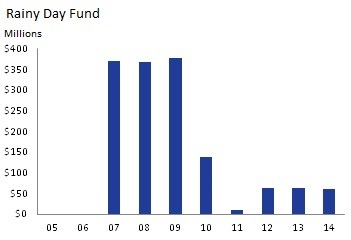 Oregon also relied on its Rainy Day Fund during the recession but has not yet begun to rebuild it. It’s important to note areas of success and we should be pleased to see some encouraging longer-term trends. 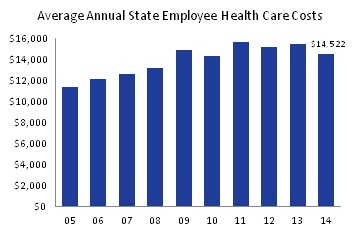 State health care costs for employees have leveled off in the past four years, and declined slightly in 2014 as a result of employee contributions. Crime rates for violent crimes continue their long decline though property crimes recently increased slightly. With federal assistance, Oregon had sufficient unemployment insurance reserves to provide benefits through the recession, and has already made great progress rebuilding the reserves. Sound financial condition is vital for sustainable government services. The state needs to continue rebuilding, and prepare for the next economic storm.